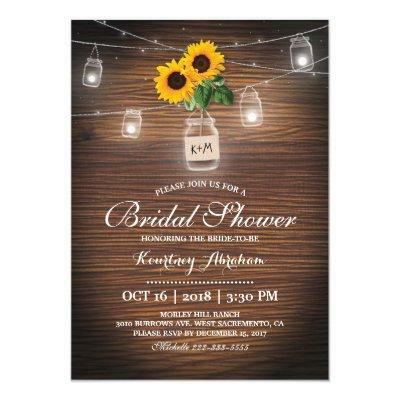 Country chic bridal shower invitation template featuring a rustic barnyard wood background, your initials printed on burlap wrapped around a mason jar, string lights, bright yellow sunflowers, and a bridal shower text template that is easy to personalize. Click on the â€œCustomize itâ€ button for further personalization of this template. You will be able to modify all text, including the style, colors, and sizes. You will find matching items further down the page, if however you can&#;t find what you looking for please contact me.